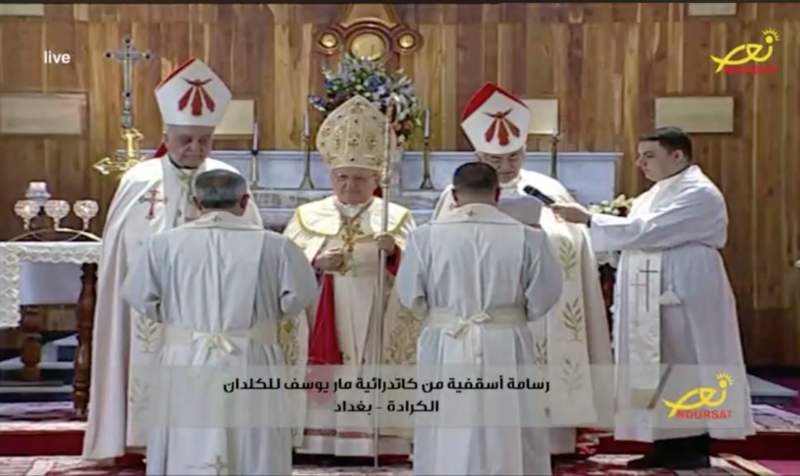 The cardinal led the ordination Mass of the new archbishop of Mosul and auxiliary of Baghdad in St Joseph cathedral. He asked Mgr Najij to rebuild trust with Muslims as well as the social and ecclesiastical fabric of Iraq’s largest northern city, once a stronghold of the Islamic State group. He appealed to the faithful to support their bishops in their mission. 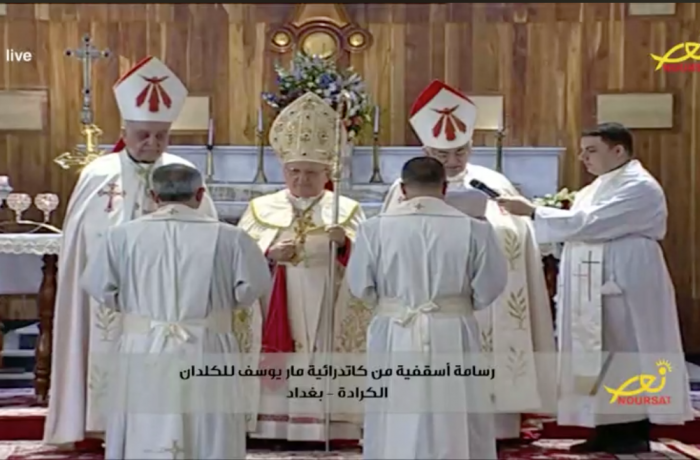 Baghdad (AsiaNews) – Fr Najib Mikhael Moussa and Fr Robert Jarjis were ordained today respectively as archbishop of Mosul and auxiliary of Baghdad. During the Mass for the episcopal ordinations, celebrated today (pictured) in Saint Joseph Cathedral, Card Louis Raphael Sako, delivered the homily. In it, the Chaldean Patriarch urged the two new bishops to love the Chaldean Church "by strengthening its unity" and the relationship with the patriarch and all its members. He told the two to love their "homeland", Iraq, source of "our identity" and "work hard for its stability", so that "it can achieve peace" and "move towards progress and stability". Noting that they have "inherited the faith of Saint Thomas", the apostle of the Eastern Church, the head of the Chaldean Church said that they will have to "lead" their "people to the Lord". For Iraq’s Chaldean community as well as the country as a whole, today is a day of celebration because it marks the full return of a pastor to the old stronghold of the Islamic State (IS) group, a place that for years was the scene of their terrible atrocities. Fr Najib Mikhael Moussa, a Dominican, is tasked with rebuilding Mosul’s social and ecclesial fabric as well as re-establishing relations with the Muslim population. Addressing him, Card Sako stressed the difficulties awaiting the prelate in a "devastated" diocese. Nevertheless, his mission is to "deepen the joy of liberation and establish the hope of returning” of Christians. To do this he will have to work “closely with those of good will", including Muslims, to build trust among Mosul’s various communities. This great challenge, he noted, will require the "active participation of the Church and Christians in public life" in a city whose ancient churches were "almost fully destroyed”. “We pray that you will be the new Jonah for Nineveh,” the patriarch said to the new bishop. Card Sako then turned to the new auxiliary bishop of Baghdad, Mgr Robert Jarjis, reminding him of his successful years as parish priest when he lived almost "independently". Now, instead, he will have to adopt a more “communal” approach to life and become an active member of the "patriarchal team" working with "eagerness, understanding, love and humility". Bishops from all over Iraq attended today’s ceremony, as did ambassadors, government ministers, Shia and Sunni religious leaders, family members and friends. Card Sako asked those present to accompany and support the two new prelates in their mission "with love, respect and prayers" because "the people around" the clergy can provide “strength”. The episcopal rank, the Chaldean primate noted, “is a calling, not a privilege” and the bishop "is nothing but a servant of people". In fact, in the Assyrian-Chaldean tradition, the bishop is called "Abun Maalia" which means "higher father" who treats his children "equally with love and tenderness" without any discrimination. Last but not least, the “bishop must realise that people are his partners and associates working as one team for the growth and prosperity of the Church” through “wisdom, listening, patience and consultation with his assistants”.